“Mapheng and Supercheng” will fight with funniness. For Suek Muai Witheethai broadcasted on channel 11 in Thailand on this saturday of 19th January 2013 , the master couple muay thai boxer or Yodphet W. Sangphraphai muay thai training camp will fight with Songkhom Srisuriyanyothin muay thai camp. Moreover, there are other couple boxers to be broadcasted , such as Maphengnoi Ch. Roachsurang fighting with Superchen S. Yingchaleankarnchang and for this couple boxer , Man Padreaw is confident to fight with funniness. In addition to, they have never fought with each other before. For this saturday of 19th January 2013 of Suek Muai Witheethai on channel 11 , there will be the making of boxer lists ; namely , the master couple muay thai boxer of Muai CP Freshmart or Yodphet W. Sangphraphai fighting with Songkhom Srisuriyanyothin and the second couple boxer or Maphengnoi Ch. Roachsurang fighting with Supercheng S. Yinchareankarnchang in 122 pounds. Then, for this couple boxer , Man Padreaw is confident that the muay thai fan club might be favored of this couple boxer because they have never fought with each other in any countryside muay thai stadium or the bangkok one. Then, it might be funny and be favored of the muay thai fan club for sure. In addition to, there might be other couple boxers to fight between Sakedthong Luakthungpho fighting with Maneechedsang S. Thianpho and Phetphatam Bemphudin fighting with Muengsiam or Kaichon S. Bunyiam Diam. Palangthip N. Sripheng revealed that he had recovered from ill after had urinated into blood and lose in the game for the last match. Lately, he has announced that he would like to fight with Yodkhunpon Sitmonchai muay thai training camp again because in his life , he has never lose with the fist before. Moreover , recently Palangthip N. Sripheing or the good form muay thai boxer had lose to Thong Phui Nai dee in Thailand , but he has been supported continually to fight in Suek Phrai Anan on this 25th January 2013 to prove of the severe fist of Yodkhunpon Sitmonchai again by bargaining the weight for Yodkhunpon 2 pounds (124-126 pounds) . Palangthip revealed to the reporters that now he had been training himself in Ubonrachathani province. However, he had overcome Yodkhunpon for one time , so he isn’t so worried about this game much. Moreover, he has never lose for any fist before also. Thus, he is confident that he can overcome him again although he had urinated into blood and not prepared well until lose to Thong Puidee Nai dee as the recent match. Besides, he accepted that it could result from his hard training and his weak body until losing. On the other hand, now he has recovered from his illness already and he is ready to fight with Khunpon without afraid of him. This entry was posted in Uncategorized and tagged camp, Mapheng, muay thai, Palangthip, thailand, training on 2013/01/31 by Mr.Muay Thai. Welcome to Thailand, the land of smiles; where the country itself is as diverse and spectacular as the glossy postcards depict. Thailand is a beautiful country, offering something for everyone: beautiful beaches, historic culture and museums, lively arts, a good nightlife and one of the best cuisines in the world. The north has lush mountains and wild rivers, the south offers numerous islands and beaches, and the centre boasts bustling Bangkok. It is a relatively safe and stable country with friendly people who enjoy an easy-going attitude towards life. Thai people hold their King and Queen and the Royal Family in great reverence, and so won’t tolerate foreigners showing disrespect to them. Generally Thai women are conservative. So don’t touch them without their consent. Call Thais their first names; use the title “Khun” for adults. Don’t touch a person’s head, nor ruffle his hair. The head is the noblest part of the body. A sincere apology should be offered immediately if you touch someone’s head unintentionally. Entering a Thai house, you’re expected to remove your shoes. The traditional greeting gesture is called a wai (hands placed together in a prayer position at the chest, chin or forehead). There are various levels of wais, the best is to just imitate the wai that is being given to you. Most Thais are not accustomed to shaking hands, but more are adopting this western approach when meeting foreigners. Thailand is the birth place or home of muay thai . Becasue there are many muay thai trianing camps in Thailand in many cities . Everyone can check the map of Thailand and find the best muay thai camp. 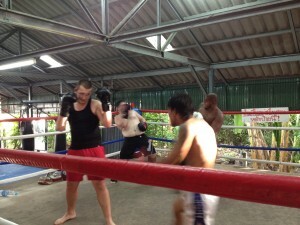 This entry was posted in Uncategorized and tagged camp, map, muay thai, thailand, training on 2013/01/26 by Mr.Muay Thai. 1. A Jumping Rope is the exercised equipment to exercise bodies in order to have strong legs with high activeness. 2. A punching ball is the practiced equipment to punch and calculate the sensitivity to eyes because the punching ball might be bouncing when it had been punched. Then, the boxer should practice to punch rapidly, control the force to punch for get balancing and practicing the quickness for the sensitivity of eyes to punch against the ball. 3. A Strap is the protected equipment from any sprain finger or any scratched finger while punching ; the boxer should wrap the fingers prior putting the boxing glove to punch the sandbag or practice to punch. 4. A suspensory used by the boxer is the protected equipment to reduce the danger of any important organ of the boxer without causing injury from punching ; the boxer must wear every time to punch in the muay thai stadium. 5. A teeth grinding is the protected equipment to reduce the danger of any tooth or mouth to be injured from punching ; it is the significant equipment that the boxer should wear to be familiar with and wear every time to punch in the muay thai stadium or practice to punch. 6. The boxing gloves is the practiced and competed equipment; they are essential to the boxer and the boxing camp that the boxer should wear them when he or she is going to practice to punch or when he or she is competing on the boxing stadium. Besides, there are multiplies of sizes for the boxing gloves from 4 – 6 ounces with different prices classified in the practiced boxing gloves to the competed boxing gloves which the practiced boxing gloves might be larger and softer than the competed boxing gloves. 7. A punch back is the practiced equipment to practice to punch the sandbag which has the shape as same as the boxing gloves , but it is smaller. Moreover, it is used to practice to punch and protect any finger to be sprained and scratched when practicing to the sandbag. In the muay thai camps in Thailand have many sandbags . 8. A boxing pad is the practiced equipment to punch with fist, foot, knee and elbow to get to the significant target of any part of body classified in to hand boxing pad , stomach boxing pad , long pad and knee guard ; the trainer should wear suitably with the body to lure the boxer to punch with fist, foot, knee and elbow on the multiplies of pads to the body of the trainer. 9. A sandbag is the practiced equipment to punch with fist, foot, knee and elbow ; it is the significant equipment that every boxing camp should have in order to be practiced by the boxer by kicking , kneeing , punching and elbowing. 10. A dumbbell to exercise body is the practiced equipment for testing the strength of body on the muscles of neck and Jaw by holding in mouth and lift up and down or practicing the force of arms by holding by hands and practicing to punch the air. 11. A barbell to lift up weight is the practiced equipment of testing the strength of muscles for arms and chest to be strong by lifting up and down. 12. A swing rope is the practiced equipment of testing the strength of wrists, arms and chests by tying on the crossbeam to swing body up and down which is being seen in the further practicing of boxing. 13. A timing clock is the timing equipment to practice the boxing of the boxer classified in to each round per 5 minutes and when the time had been passed for 1 minute , it was called 1 passing. Then, when the time had been passed for 5 minutes , it was called 1 round . Moreover, the boxer will practice in 8 -10 round when he or she has practiced the boxing. 14. The boxers are the shorts with the wider of clothes for legs, cutting out with several shining colors and sewing with the name of boxer and the boxing camp on the boxers which the boxer should wear when practicing in the boxing camp and competing in the boxing stadium. 15. A foot wrap is the protected equipment to reduce danger of any foot wrist for the boxer not to be sprained while kicking the sandbag or competing in the boxing stadium ; the boxer should wear it all the time when competing in the boxing stadium to protect any feet wrist to be sprained from kicking another boxer. This entry was posted in Uncategorized on 2013/01/25 by Mr.Muay Thai. Muay Thai Training camp & Lab. Muay Thai or Thai boxing is an ancient sport of Thai people and it is popular to our people in every period. Moreover, in the early period of muay thai it didn’t have any writing rule, but the referee could describe the rule to the competed boxer to inform about principles in that competition. On the other hand, when these rules are applied increasingly, they become to be the tradition and they are used as the principles for competition afterwards. There are many muay thai camps in the worlds or in Thailand . Then it is good to training muay thai in muay thai camps . History of Muay Thai or Thai boxing from Thailand . There is no appearance for beginning of muay thai or no book to write about this story , but as we know Thai boxing has begun in long ago. Moreover, it might be happened promptly with Thai nation because Thai boxing is the art of Thailand. Then, it is hard to be imitated from other nations. As we know in the past that Thai boxing is depended on practicing of among soldiers because in the past our Thai nation had to fight with our neighborhood countries frequently. Moreover, in that period the way to fight was no have gun , but they fought with swords by two hands or one hand. If it was as this situation, the fighting could be fought near to the enemies. Then, they could see that at that time they fought with swords and it was the fighting too near to the enemies and sometimes the enemies could stab us easily. As the result , Thai people had practiced how to shove away and how to kick the enemies in order to make them lose their target and we could choose to stab them easily with making them lose to fight much more. Later, when all the soldiers had practiced how to shove away and kick , they had thought about how to alter the way to shove away and kick to be the martial art by hands. Then, there were several numbers of Thai people who thought about how to create Thai martial art when celebrating of festivals to show their people. Furthermore, it was the new idea. Then, Thai people could see how to shove away and kick popularly and frequently. Furthermore, it made Thai people knew how to practice Thai boxing much more until locating to be the boxing office teacher increasingly. However, as for practicing muay thai , it could be the office of famous sword teacher with having the good teacher to teach them first. In the ancient period , most Thai people believe that who has good sword principle and good at fighting , he should be good at muay thai also because when they had to fight , it was based on Thai boxing to assist them. Then, in that time muay thai principle had aim to practice with sword principle and muay thai principle combining together for protecting our nation with their statuses of soldiers to be good at protecting. On the other hand, when it had finished from war , it had the muay thai show for fun or played gamble between good muay thai from one village and another good muay thai from another village to fight in front of the stage during festival. Besides, sometimes it had the gambles to each other. Then, at that time Thai boxing could punch with fist with no wearing rope , such as in the early period of Ayutthaya period which at that time Thai people had been well-known by using Thai boxing principle at most that is from the man named “Kanomtom” who used Thai boxing principle to fight with ten Burmese and could overcome all of them. After that, one Burmese King had said “although Thai people don’t have any sword and even they use only one hand , they got a lot of poisons. Besides, the man named “Kanomtom” is like the father of muay thai because he made Thai people being well-known about muay thai much at that time and his name has been spread out until nowadays. He is one of many muay thai camps . In the next period , they had still practiced Thai boxing with sword principle and practiced to use in war or fight to protect themselves. On the other hand, sometimes they had practiced to fight when having several festivals in the final period of Ayutthaya period. Moreover, there were some of Thai kings who had been good at Thai boxing , such as Phra Chao Suua or Khun Luang Sorasak who had escaped from his palace to fight with Thai people and could overcome them. Then, Thai people had known and seen that he is good at Thai boxing in the excellent level. Furthermore, there were a lot of kings to be good at Thai boxing , such as Phra Chao Taksin and others. On the other hand, muay thai or Thai boxing has been lasted until nowadays and in the final period of Ayutthaya period there were fighting with wearing rope or using the ropes to wrap their hands. Moreover, sometimes they had punched until death because the roped to wrap their hands could be made of oil with the pieces of glasses. Then, when they had punched in any part of body , they had got their wound at that part. However , it was seen that muay thai at that time was so dangerous. But you can train muay thai at good muay thai camp to learn of real muay thai . This entry was posted in Uncategorized and tagged camp, lab, muay thai, thailand, training on 2013/01/24 by Mr.Muay Thai.